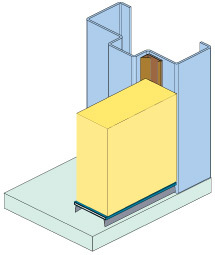 This intumescent type Batwing® seal is simply fitted into the rebate of a door frame to provide resistance against fire, smoke (ambient, medium and hot temperature), sound, draughts, dust and light. Tested on proprietary fire doors for up to 2 hours fire resistance. Fits quickly and easily without removal of the door. Provides an excellent acoustic & smoke seal across all temperatures. Two elastomeric sealing fins cater for excessive door movement across varying temperatures. Simple self-adhesive application onto the door frame. Strategically located in the impact free zone of the opening. Used in conjunction with a Lorient door bottom solution such as the IS8010si automatic door bottom or LP4204TF seal to provide a total door sealing system incorporating ambientmedium- hot temperature smoke and acoustic properties. Lorient high performance graphite based intumescent core with PVC backing incorporating two elastomeric sealing fins. Supplied with aggressive self adhesive backing tape on both sides of the carrier. The product is fitted into the rebate of the door frame and applied using the integral self-adhesive backing tape. AS1530/4 fire tests with proprietary fire doors providing up to 2 hours fire resistance. AS1530/7 air (smoke) leakage rates available at ambient & medium temperature at various pressures. Acoustic ratings to AS1191 and AS1276 in conjunction with other Lorient Integrity seals. Tests have been conducted demonstrating over 100,000 open and close cycles without significant wear. Lorient HP2512BW fitted into the rebate of the door frame.